A Note from the Editor | Winter 2017/18 | MeetMinnie. Hello and welcome to the Winter 2017/18 issue of MeetMinnie magazine. We’re so happy you stopped by! 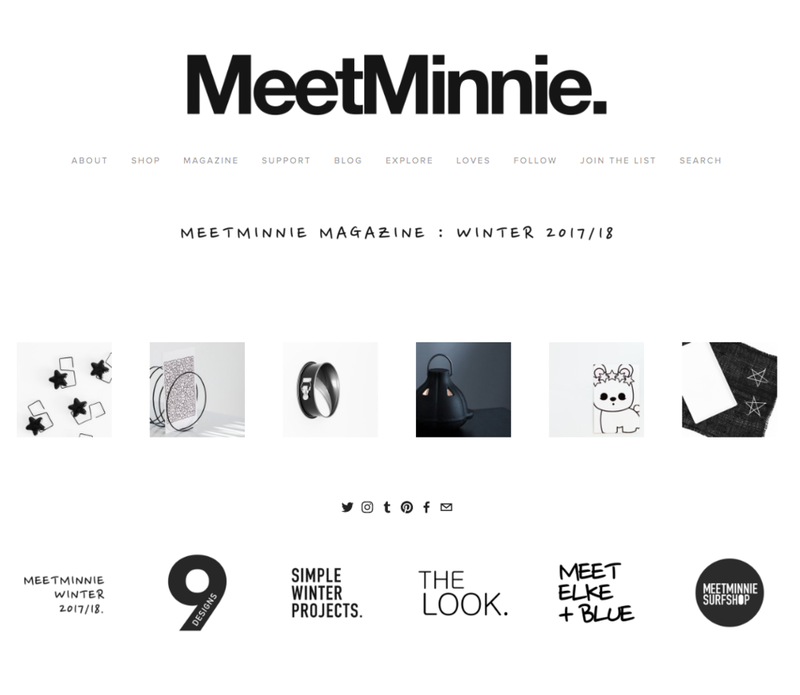 Created in 2012, MeetMinnie is a magazine, blog and studio devoted to minimalist style for you, your wardrobe and your home. It's true. MeetMinnie does not look like other magazines. Pages that flip are a thing of the past. We've traded virtual pages for an index where articles, projects and picks are just a click away. We hope you find the format mobile-friendly and user-friendly. Give it a try and let us know what you think! In other news...MeetMinnie turns 5 this year! We're thrilled with the evolution of MeetMinnie in this relatively short time. What began as MeetMinnie magazine now includes the MeetMinnie SurfShop, the MeetMinnie blog and Elke + Blue, our fun new collection at Redbubble featuring our favorite dress-up Shih Tzu pups (plus a couple of bunny friends) and a playful world of color and pattern. MeetMinnie is building, and we couldn't be more excited. Thank you for joining us on the journey! In this issue, we’ve focused on winter's magical light. Endless starry skies. The warm glow of home. Forests filled with moonlight. Lanterns and candles. Icy reflections. We've tried to capture winter's glorious magic in each of our features. We begin by celebrating the chill of winter in our curated shopping feature, TheLook, with a collection of pieces in shades of white, silver and ice blue. Cool. And who could forget 9 Designs? DIY projects perfect for last-minute holiday decorating, dressing or gifting, this installment of 9 Designs features a collection of projects that are super simple and fun. Oh, and don't forget to check out what's new in the Elke + Blue world since our last issue! Our feature Meet Elke + Blue includes snaps of some of our favorite products (but honestly, narrowing down favorites was almost impossible) as well as a feed to keep you up-to-date on the latest Elke + Blue news. Shop the whole collection, including men's, women's and children's apparel; decor; paper; prints; tech and bags right here. We would like to extend our continued thanks to the family, friends, readers and supporters of MeetMinnie. We could not do it without you! keep up with us on Pinterest, Instagram, Facebook, Twitter, Tumblr and on our blog for the latest MeetMinnie info. And don't forget about the MeetMinnie SurfShop! Check it out for t-shirts, sweatshirts, bags and more in our signature designs. Shop for gear here or click here for behind-the-scenes snaps. Wishing you a beautiful + magical winter! Stay tuned for our Summer 2018 issue, coming in May 2018. Click here to read the Winter 2017/18 issue of MeetMinnie!